Posted 7/5/2013 12:20pm by Cheryl Ferguson. Happy Friday, Farm Friends! Hope you had a wonderful 4th of July! Lots of things happening on the farm -- mostly focused on garlic, of course! We have everything out of the fields with the exception of one variety, Nootka Rose. As a silverskin, this variety is one of the last to come out. We are also trying to hold it in order to use it for an upcoming segment of WUNC-TV's Flavor NC! Yes, we will be featured in an upcoming segment and they will focus on our garlic! How exciting!! We'll share more information on this next week! A great boost to our garlic harvesting was the "Crop Mob" that we had last week! What a wonderful group of volunteers who came out for the day to help us harvest, clean and hang garlic. We harvested "Music" (our best selling variety) and it was GORGEOUS! Based on the picture and quick post that I put on Facebook after Friday's event, I was contacted by The Stokes News and asked to write an article on the crop mob and our garlic. It ran this week in The Independent and will be in The Stokes News next week. Check it out! A HUGE shout-out to our great group of volunteers who helped bring in the garlic! Somehow with all the rain we are having, the blackberries are finally starting to ripen. We'll have a good number of them at market this week (that is if it can quit raining long enough for me to pick!). The Navajos and Ouachitas are coming in now and the yummy Triple Crowns will be ready in a couple of weeks. Once we have a good number of Triple Crown, we'll open up the field for a Pick-Your-Own! Remember the kittens and mama cat from the last post? Well, we are definitely trying to find homes for 3 or 4… so if you or a friend would like to know more about a great little kitten (with terrific mousing genes! ), please let me know! Posted 6/21/2013 1:18pm by Cheryl Ferguson. Happy Friday, Farm Friends! And Happy First Full Day of Summer! This week has been mostly focused on garlic harvest. Have pulled three varieties so far and they are looking really good! All the rain we had on Tuesday slowed us down some but it's not going badly. It sure is nice having such cool weather for this work - last year during garlic harvest , the temperatures were more like the 90s instead of this year's plesant low 80s! Nice! We are trying some new approaches to our harvest this year - trimming the roots and cleaning the bulbs pretty thoroughly before we rack or hang them. We'll see how it works - every year we try to improve our technique! We finally got all of the raspberries planted including the black raspberries! Unfortunately we won't have berries on the blacks until next year but the reds should produce. But get your mouth all ready for blackberries! The blackberries should really start coming in around the first week in July - we have a few now but not enough for market. There may be a pick-your-own in the future! I'll close with a bit of cuteness - when we were cleaning garlic at the Tobacco Barn, we kept hearing mewing. Christian and Ray went out to investigate and found 3 kittens about 8 weeks old. We were able to catch them and put them into a dog crate (of course!). After lunch today, we were able to get the mama cat and 2 more babies. We want to get them spayed and neutered and may keep them as barn cats...unless any of you wants an adorable kitten! Thanks for your support of our farm and our work! It means so much to us to have great friends and supporters like you! In case you are on Facebook, check out our page there and "Like" us -- we are trying to get to 500 Likes before the end of July! Posted 6/14/2013 9:57am by Cheryl Ferguson. Happy Friday, Farm Friends! And Happy Flag Day! We are feeling grateful this morning that the storms yesterday passed us by – amazing that there was so much destruction so close to us while all we saw was a dark sky, a little downpour and some wind. Our thoughts and prayers go out to those who experienced damage. Things finally dried up enough that we were able to plant raspberries in Raz 1 (our pick-your-own field). The field had really suffered from the past couple of years of heat and drought-stress, so we wanted to replace all the plants. Some of our favorite varieties are in the field now: Caroline, Anne and Joan J. We should get some berries this year from these but only a partial crop – but we are still hopeful that our main field will have a good yield! The big news of the week is that the garlic harvest is beginning! Next week we will really be up to our necks (pun intended!) in garlic! First it’s the softnecks (Inchellium, Red Toch) and then we move to the hardnecks (Georgian Crystal, Bogatyr, etc.) Our barns will soon be bursting with garlic! We’ll have more fresh, uncured garlic at market this week. We will also have our beautiful Elephant Garlic flowers available. They make a stunning floral arrangement that lasts for weeks! Don’t forget that Father’s Day is Sunday! I’ll bet your Dad likes to grill (or at least eat grilled food!). Take a taste of our Raspberry-Chipotle Molé Grilling Sauce – a sweet and spicy blend that is terrific grilled on chicken, pork or shrimp. We’ll also have lots of jars of our raspberry or blackberry jams. Tastes are encouraged! We look forward to seeing you at market! You can always call or email to let us know if you'd like something saved for you. Posted 6/6/2013 2:18pm by Cheryl Ferguson. Happy Thursday, Farm Friends! And Happy June! Trying to get back to farm work after The Great Tree Collapse took some real focus. The main task for the week has been to plant raspberries but we keep getting delayed by the weather. This rain cycle just keeps on coming! 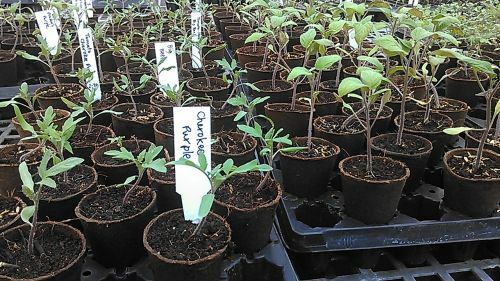 It is nearly impossible for us to be able to get into the field to form beds for tomatoes and peppers so we’ll just be planting into flat rows – not the ideal but we must get many things into the ground since its so very late. Don’t forget that Father’s Day is just around the corner! If your Dad likes to grill (don’t most? ), check out our Raspberry-Chipotle Molé Grilling Sauce – a sweet and spicy blend that is terrific grilled on chicken, pork or shrimp. We’ll be sampling it on Saturday with some chicken. If Dad’s not a griller, then maybe he’d like a jar of our raspberry or blackberry jam. Stop by and try a taste! Thanks so much for your support! Look forward to seeing you at market! You can always call or email to let me know if you'd like me to save you something. Stay dry and take good care! Posted 5/31/2013 8:02am by Cheryl Ferguson. One project that is nearing completion is the potting bench and irrigation in the greenhouse. It is AMAZING what Ray has done in this space! I keep saying that we should just move in there permanently one day because it is such a wonderful house -- much more light than this old farmhouse! Check out our new potting bench -- complete with sink! For those of you who have been waiting to come up to pick strawberries, I am sorry to deliver bad news. We are not going to be able to do any pick-your-own strawberry events this year. The production is just not there and I'd rather disappoint you now than to have you come up and be disappointed by the quantity of berries. We are very sorry for this because we love having you and your families here in the field -- but don't despair, Blackberries are coming very soon and we'll be opening that up for PYO this year! There are LOTS of berries!!! And for your Summer cookouts & grilling, stop by and taste a sample of our popular Raspberry-Chipotle Molé Sauce! Thanks to the great response to our last batch (it went quickly!! ), we made a big ol' batch so we'll have plenty tomorrow! We'll also have our luscious fruit-forward raspberry and blackberry jams. Hope to see you at market on Saturday or Wednesday! You can always call or email to let me know if you'd like me to save you something. Take good care and enjoy the beauty of the early summer -- have you seen the lightning bugs yet??! Posted 5/24/2013 3:57pm by Cheryl Ferguson. Well, not really but it sure has seemed like a scene out of the film, "The Piano" during the last week. The rain and clouds have definitely had a dampening effect on our production. We haven't started building raised walkways yet but it seemed to be almost a necessity a few days ago -- have gotten over 4 inches of rain! I was just out in the garlic field and it seemed like the tide had finally gone out -- hooray! Speaking of the garlic field, the garlic is starting to begin its late spring Scape Ballet. I love the curling and twirling that the hardneck garlic "flower" stalks do at this time of the season. If you let them, the scapes will get very tall and straight but we harvest them early so they are tender -- we like them better that way and we know that you do too! Look for them on our market table for the next couple of weeks. Check out the shallot flowers too -- it is essentially the scape on a shallot plant. Interesting fact: another term for scapes is "garlic whistles" - just in case you are ever on Allium Jeopardy! The dreary weather has definitely dampened the spirits of the strawberries. We unfortunately will not be able to have a pick-your-own this weekend on Monday, May 27 (Memorial Day). Hopefully with the sun and warmer weather forecast for the coming week, we can invite you to our strawberry field next weekend (June 2). Sorry to have to postpone once again! We'll let you know definitely by next Friday of our plans. It is great to be back in Old Salem on Saturdays! Thanks so much to those of you who came out last week -- and there were some brave souls who were even shopping in the pouring rain during the last 30 minutes! Tomorrow is supposed to be a beautiful day. Market starts at the bell ring at 9 and goes until noon every Saturday. 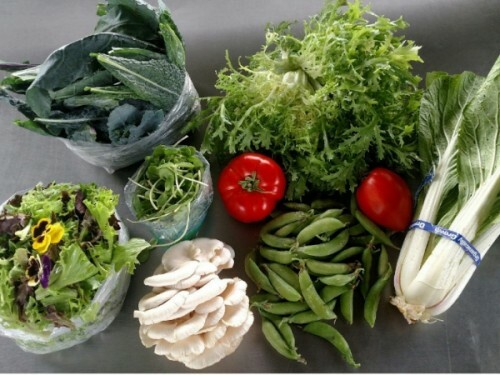 The King Farmers Market at the Stokes Family YMCA runs every Wednesday from 11-1. Keep on sharing the news!! Let's celebrate this gem in our community! And for your Memorial Day cookouts & grilling, stop by and taste a sample of our popular Raspberry-Chipotle Molé Sauce! We'll have a limited quantity tomorrow so better hurry! We'll also have our raspberry and blackberry jams and the last of our Yam's Jam Sweet Potato Butter. Take good care and enjoy the return of our friend, Mr. Sun! Posted 5/16/2013 5:22pm by Cheryl Ferguson. It seems that we have blasted into mid-summer directly from early spring -- all in a matter of a couple of days! Some of our farmer friends were actually hit by frost earlier in the week -- we were very fortunate and dodged it. However, the cooler weather did slow down the development of the strawberries. We had hoped to do a pick-your-own this weekend but we need to push it out a few days. Our current plan is for Monday, May 27 (Memorial Day) from 8-noon. Sorry to have to postpone it but we want to have plenty of berries for you! 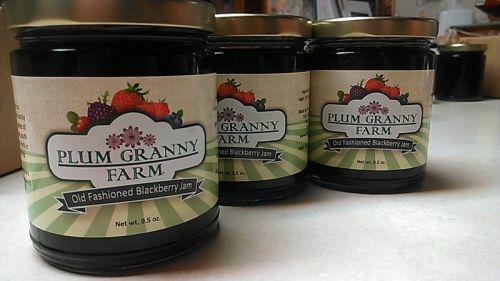 For last minute updates, please check our website (www.plumgrannyfarm.com) or give us a call (336-994-2517). We plan to have a few more berry picking days during the season. We will be back in Old Salem on Saturday (Next to the Single Brothers Garden and behind T. Bagge Merchant). So excited to be back to that terrific location! Our tent will be at the same location that we had last year -- at the end of West Street near Old Salem Road. We'll be at market from 9-noon every Saturday. The King Farmers Market at the Stokes Family YMCA runs every Wednesday from 11-1. Lots of newcomers to the market -- keep on sharing the news!! And it’s back for the summer season! We’ll have a new batch of the Raspberry-Chipotle Molé Sauce – perfect for Memorial Day cookouts & grilling! We'll also have our raspberry and blackberry jams and the last of our Yam's Jam Sweet Potato Butter. Take good care and enjoy the fruits of the season!! Posted 5/10/2013 3:18pm by Cheryl Ferguson. And Hello Sunshine! We have missed you so much! Now that we have recovered from that project, there are lots of other things here vying for our attention. Grass to mow, weeds to pull, strawberries and asparagus to harvest, raspberries and blackberries to plant, finalizing fields for our summer crops, and, and, and... As it finally gets warmer, Spring has really kicked into high gear! Our markets are coming along nicely. This Saturday will be the last day for the Cobblestone Farmers Market at its downtown location at the Milton Rhodes Center for the Arts (251 N. Spruce Street -- 1 block off Fourth Street). Next week (May 18), we move back to our Old Salem location where we will be for the remainder of the season. That market runs from 9-noon every Saturday. The King Farmers Market at the Stokes Family YMCA runs every Wednesday from 11-1. We are seeing lots of new faces and that is wonderful! If you have friends or family in the King area, please let them know about this wonderful market! Strawberries are slowly starting to come in. The Sweet Charlies arrived first and will be followed by Chandlers. We think we will probably have enough berries for pick-your-own next Saturday (5/18) but we will let you know for sure later in the week. Hope to see you at market tomorrow or Wednesday! You can always call or email to let me know if you'd like me to save you something. Take good care and enjoy the sunshine while it lasts!! Posted 4/26/2013 8:59am by Cheryl Ferguson. Busy, busy, busy as our bee friends! Yes, Spring is in full tilt mode here at the farm! And we are running around trying to stay ahead of the curve! Got the 1/2 acre of potatoes in the ground this week -- a great accomplishment using Daddy's transplanter! Now we'll have it ready to roll for other things such as the tomatoes and peppers! Ready for some potato love? We are excited that the King Farmers Market at the Stokes Family YMCA will start next Wednesday, May 1st! We will be at that market every week with some other wonderful farmers. Our motto there is "We Grow What We Sell" and that market has been doing that for 15 years! What a gem! Come out on Wednesday to the Stokes Family YMCA at 105 Moore Road in King and check it out! Market hours are 11-1. Tomorrow will be a busy day in Winston-Salem and part of the wonderful vibe is the Cobblestone Farmers Market! The market is from 9-noon and is located at the Milton Rhodes Center for the Arts (251 N. Spruce Street in downtown Winston-Salem -- 1 block off Fourth Street). And for you strawberry lovers, here's a picture to let you know what's in store in the not too distant future! This scene is probably about 3 weeks away!! Posted 4/19/2013 5:43pm by Cheryl Ferguson. Whew! That was a big storm that we had this afternoon! Several large branches blew down and we lost a tree on the property next door but everything else seems to be just fine. Before the storm, we got started on our potato planting. We are using my Dad's old tobacco transplanter for the first time this year. We have more than doubled our potato crop for this year -- we have nearly 1/2 acre! That's LOTS of fingerling and standard potatoes!! Get your roasting pans ready for late June! Hope to see you at market tomorrow! You can always call or email to let me know if you'd like me to save you something. Just one more picture to get you in the mood!